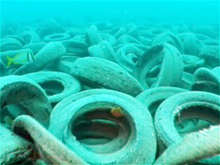 A tire reef off the coast of Fort Lauderdale, Florida. In the 1970s, approximately 2 million tires were dumped here to create an artificial reef, in what is now recognized as a colossal failure. Three decades later, military divers have begun removing the tires as part of their dive training. Marine life hasn't colonized the "reef," because the tires are too light. They break up and move about under the action of the ocean, and when they do, they damage natural reefs. Attempts to build tire reefs with bundles of tires or by weighting them with concrete have also failed. Moreover, the tires are thought to leach toxic materials. Tire reefs all around the world have exhibited similar results. In retrospect, the effort was a failure, but hindsight bias has prevented us from recognizing the true failure of the effort: omission of a long-term testing program. The concept of tire reefs was indeed flawed, but there has been little discussion of the reason why a one- or two-decade testing program wasn't undertaken before the major dumping occurred. Because failure to address that question exposes the world to repetition of this large-scale environmental disaster, one can only wonder why the threads of such a discussion aren't as widely available as the stories of the failure itself. Photo by U.S. Navy courtesy Wikipedia. People often believe that an outcome was predictable or even inevitable, after they know what that outcome was. When we do this, sometimes we're right, but often our sense of predictability or inevitability is exaggerated. This perception is so common that psychologists have given it a name: hindsight bias. Because of hindsight bias, we tend to see causal connections between antecedent conditions and outcomes, even when those supposedly causal connections are false. We tend not to recall conditions that would introduce uncertainty in the outcome, or which would tend to produce dramatically different outcomes. And we do recall elements that didn't exist if they support explanations that predict what actually happened. For example, in a written evaluation of a subordinate's performance, a supervisor might observe, "George's impulsiveness created toxic conflict, not only involving George, but also between other team members." Toxic conflict might well have occurred, but was George's impulsiveness really the cause? Or was it an effect? A more useful comment would have provided evidence for the supposed causal connection, and it would have addressed alternative explanations for the toxic conflict that did occur. Here are three suggestions for managing the risk of hindsight bias in the workplace. Ignorance of hindsight bias allows it to thrive. Educate all those responsible for interpreting past events. Give them the tools they need to detect hindsight bias in themselves and their own thinking. Although awareness and sensitivity can reduce the incidence of hindsight bias, total elimination is almost certainly impossible. Cooperative action is required. For example, in the performance appraisal process, supervisor and subordinate can be encouraged to discuss the possible presence of hindsight bias in the appraisal, and then come to agreement that they have dealt with those possibilities. Introducing this idea into the appraisal process is an example of mitigating hindsight bias risk. bias allows it to thrive appraisal and project retrospectives — are merely examples. Strategic decisions, including decisions such as reorganizations, acquisitions, relocations, downsizing, outsourcing, and more, are often subject to evaluation, and therefore hindsight bias risk. An inventory of all processes for hindsight bias vulnerability is a necessary element of any program to address the effects of hindsight bias. Would you like to see your comments posted here? rbrenzWMPRVONHNyPTznuner@ChacPoTPSfguJAKGgODxoCanyon.comSend me your comments by email, or by Web form. I offer email and telephone coaching at both corporate and individual rates. Contact Rick for details at rbrenRGffpNnyYqYUWejqner@ChacwtotIAJcMqbmvCjmoCanyon.com or (650) 787-6475, or toll-free in the continental US at (866) 378-5470.